Becca and Brian's Grand Adventure: Thailand: The land of friendly people and whiskey... is that a good thing? Thailand: The land of friendly people and whiskey... is that a good thing? No, we haven't be captured by Thai rebels or stomped by any elephants. Instead we're just rising out of our food stupor created by our four days learning Thai cooking. Plenty of exciting stories and pics and the secret to Thai cooking, but I leave that for another entry from my now gourmet cook wife. - For anyone who's ever thought about traveling to Thailand but is concerned about coming because of language differences, cleanliness, etc. don't be. It's just as easy traveling here as it was traveling Europe. Even easier in some places. My impression is this is easily the most accessible to people on a short vacation. - Most of the ease in travel comes from the Thai people. Everyone we'd talked to before we'd visited had gushed about their friendliness and general goodnatureness. We'd certainly agree. Plenty of smiles, eye contact (a pleasant surprise after many European countries) and overall goodwill. 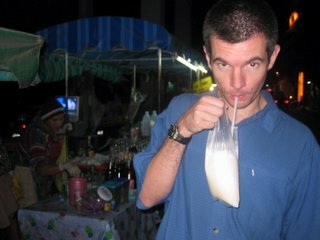 - The Thai goodwill is a double edged sword in the more populated tourist areas. A large number of the Thai are involved in the tourist industry. Our hostel has it's own cooking school next store, sells bus and flight tickets, runs a number of treks and for all I know has i's own brothel. In short, everyone provides everything. Heck even the Pad Thai food stand might have a suggestion of who to tour with if you asked them. Talking with the teachers at our cooking school was informative as many of them served as guides or did other tours in their spare time to earn extra cash. As a result, it's nearly impossible to find an objective opinion about any of the local attractions, treks, routes out of town or even where to get a decent pint from the locals which had been our strategy to this point of the trip. Lends to more blind decision making and a lot more desire to be in hostel type situations where we can pick the brains of fellow travelers. - Walking is not big here. In fact it seems to be actively discouraged. Tuk-Tuks and Scooters rule the day. Becca and I have explored our stops (including biggies such as Paris) on this trip almost exclusively on foot. However in Thailand it's an adventure. What little sidewalks there is typically are filled with street vendors, leading to two directions of people trying to get through the same hole. Walking along the edge of the street is even more adventurous as even if you think you have some space, you're more than likely to have a scooter come buzzing from behind a truck or car. And even if after all that you're still willing to walk, the Tuk-Tuk drivers are trying to get your fare about every 10 ft. When you tell them "mai chai khrap" (no), they look at you like you've had a "happy" pizza or something. - Along those lines, crossing the street is like the old Frogger game. They don't stop, even if you've somehow secured a crosswalk AND a green walk sign. Even the locals drop into a full sprint when necessary. Our solution: find the local, let them get between you and the traffic and move on their cue. - TV's are prevalent in a large percentage of shops throughout Thailand. You can be walking down the street, look into a store and their heads are looking up at whatever is on. Makes sense for those whose workplaces are merely the front of their residence but there's something amusing about watching someone watch TV in an empty bank after hours. - One funny note. In the Thai language there are different words for women and men to use to end their sentences. For the men, it's khrap. I've lost count the number of times I've said something to someone in Thai (we've gotten up to about 30 words/useful phrases) forgotten khrap, only to utter the American version halfway down the road. Occasionally I even utter it quick enough for me to prevent offending whomever it was I'm talking to. So there you go. Thailand has been a great way to start the adventure of SE Asia and comes highly recommended for anyone looking for an initial trip to this part of the world. Great people, cool touristy things to see and just a very accessible entrance to a different way of life. That being said, the amount of tourism is a bit overwhelming at times. We've enjoyed the more off the beaten path locales on this trip so we're looking forward to continuing our adventure over the border and into the slower (and less developed) country of Laos. We've been told multiple times that Laos is like Thailand 20 years ago. We're looking forward to it. We've been to Thailand twice now, and reading your blog is like reading our own experiences :-) We love the country and the people ( except the ones who always ask where you from, and end up sending you to a "friends" taylor-shop ). BTW, when you get to Chiang Mai, visit the local market, near the old wall that used to surround the city. YOu can buy little birds in bamboo-cages...the point is to buy them and set them free. The gift of freedom to the bird is meant to bring you good fortune..